The monkfish is an unusual species of fish that is landed in New England and the Mid Atlantic states. These odd-looking fish are equipped with a stalk above their head which they use to attract prey close enough to swallow. 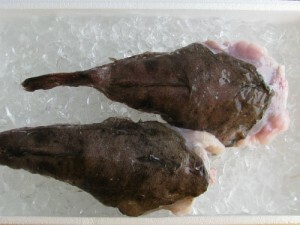 Monkfish are usually sold “head off”. Other names for the species include goosefish and angler fish.